2012.08.07 北極圏突入!! 祝77,777km達成!! マグナス、トーマス、パーベルとの出会い / Arctic circle!! 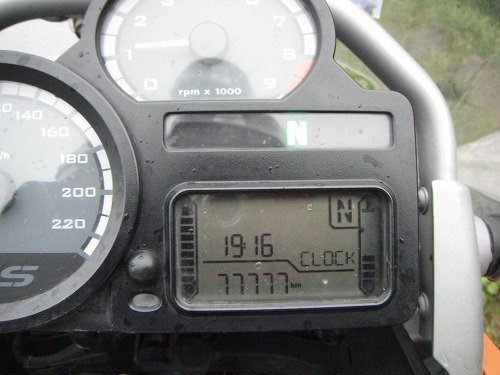 77,777km!! Meeting Magnus, Thomas, and Paul! 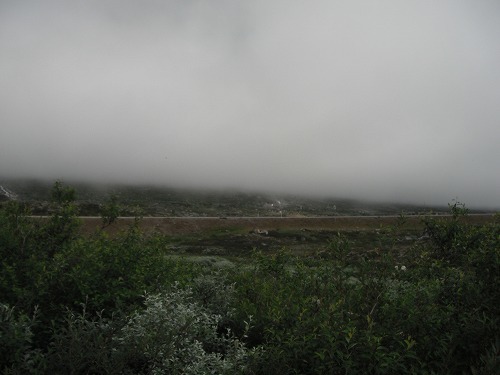 2012.08.07 北極圏、まですぐそこ / Arctic circle is... nearly there! It was cloudy but did not look like going to rain at all! In the morning, we motorcyclists talked a lot. 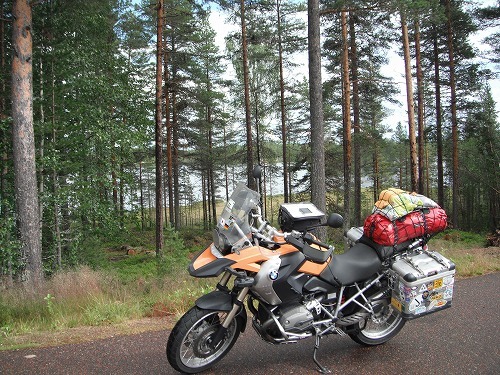 We met an Aussie / Russian couple on 2 Bimmers with Dubai licence plates! They are Shaun and Alexandra. When we realised it ws alrady 10am! Thomas and Paul filmed our interviews and we got ready to go! 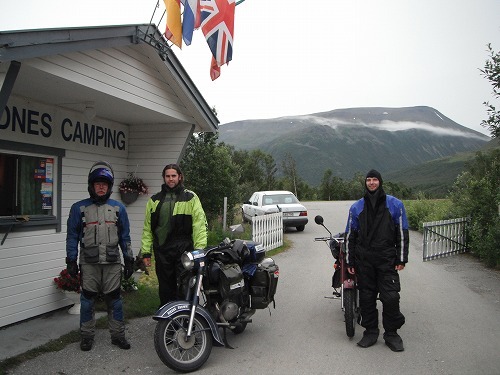 Shaun and Alexandra were heading south and Thomas and Paul were catching a ferry to go to an island further north than Nordkapp. So we said a good-bye to them and left the site. Buen viaje, is amigos!! WIth Magnus, we headed north. I encountered a reindeer within a few minutes after we took off. Magnus said, "You will see lots of them fromnow on. 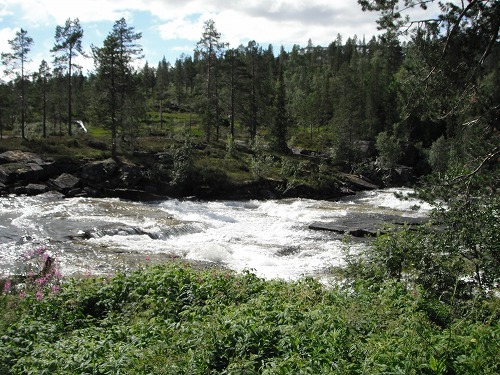 Especially in Finland, there are heaps. So you have to be careful!". As he said, I saw many reindeers on the road. Often they were in herd and sometimes after we came out of a corner, they were on the road!! 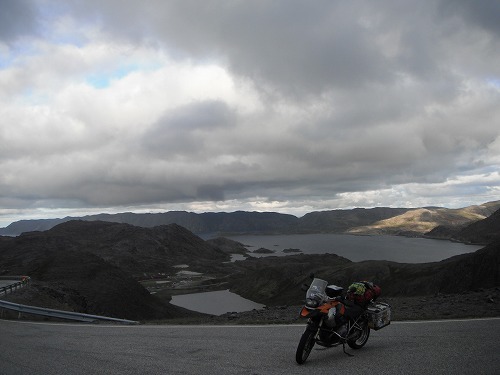 We rode along side of fjords. I liked riding through those twisties. There were heaps of wonderful sceneries. But I could not find a place to pull over (also as I was enjoying riding, I did not want to stop at all! ), there was no photo. Once we left the coast and came up little higher, the scenery became just like Altiplano of Andes. The chilled air was also similar to that of Altiplano. Then we entered the underground - cross channel - tunnel. There used to be a toll until recently, but as they had made enough money to cover the construction cost of the tunnel, it became toll free. After we came out from the long, long tunnel, there was a blue sky! 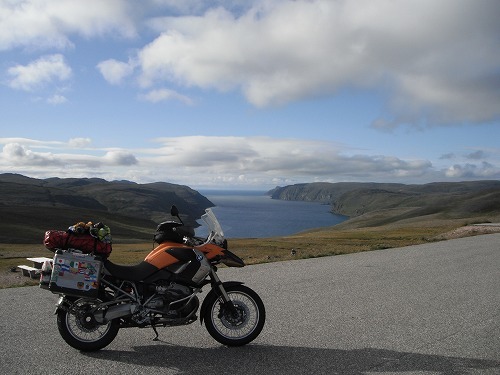 Everywhere we went, there were fjords could be seen. Norway is a fantastic place! 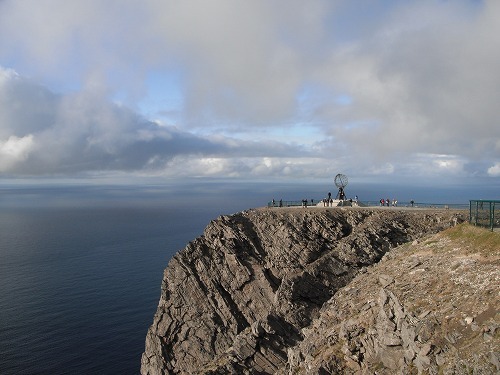 Finally, we got to "Nordkapp" - the northernmost place can be accessed by a public road. However, the entrance fee was 160 Krones!! In fact, the place was discounted one. The actual price was 235 Krones, which included a movie of Nordkapp... A girl at the toll gate asked for 235Ks first. But Magnus told her that I was from Japan and asking for a free entry for me, then she suggested the 160Ks option. Well, if we had to pay, we had to pay. We parked our bimmers at the parking lot. Here was as far north as Esperanza could go. I could see the monument in a distance. The scnery was actually quite spectecular. 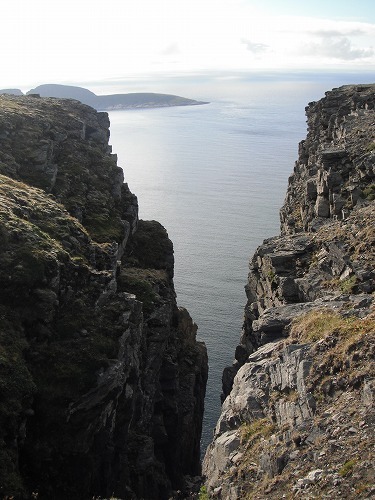 The cliff was really high above the sea. Yes, here is "the end of the world". 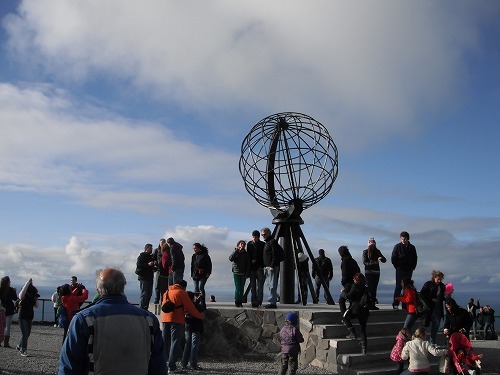 There were heaps of tourists in Nordkapp. Many tourist buses brought many tourists here. I was wondering what made them come here? Well, Magnuas and I was there, so we were the same as other toursits, but I was still wondering what would be their motive. 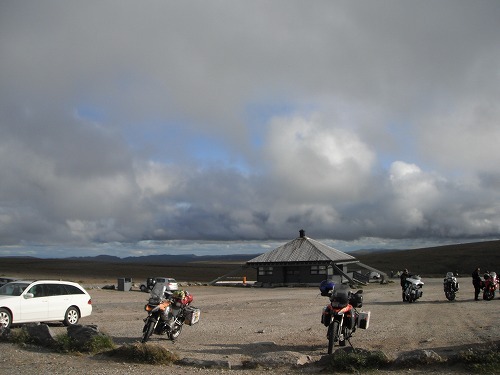 Well, it should be that here is the northernmost place can be accessed by a public road. 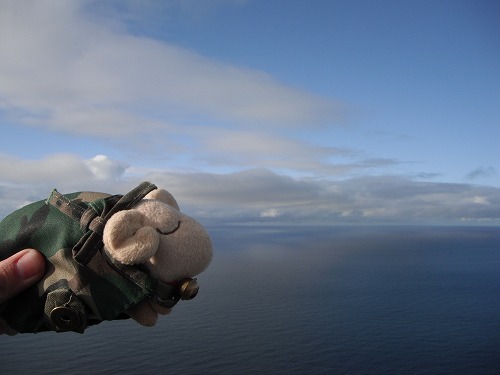 Well, Mr. Sheep was very happy to get there! From the edge, I could see Arctic Sea. North Pole will be there. The location was N 71°10'21". According to my GPS it was 71°10'264". This woud be as far north as I would go on this trip. There were some art works around the site. There was an art done by a Japanese girl "Ayumi". 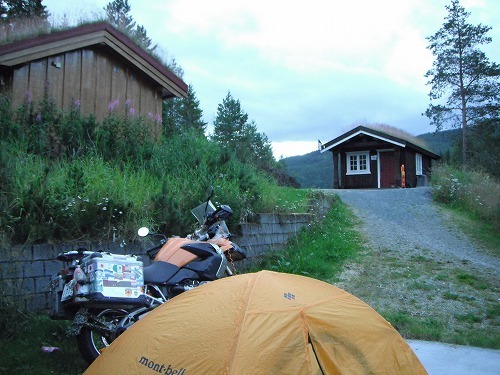 When we were coming back from Nordkapp, it started to rain. If we pitch our tents, it would be free, but it was windy and cold. So we decided to stay at a cabin again! It cost 300Ks each... Expensive, but we desearve a treat! 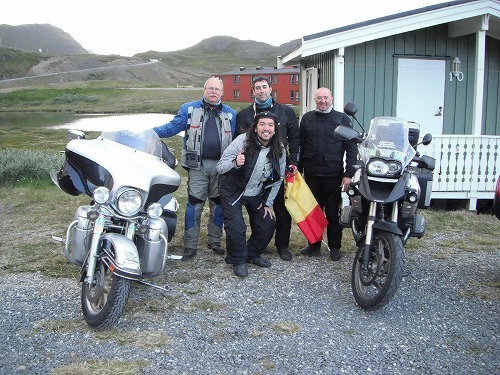 Then we met fellow motorcyclists, Roger, Claudio (Italy) and Pepe (Spain). Rodger made us cup of Italian coffee and we all talked in Spanish (well Magnus does not speak Spanish, so I translated). Pepe was inpressed to speak in Spanish with a Japanese at the end of the world!! "If you come to Italy, please come to visit us. Let's rde together! ", said Rodger and Cloudio. 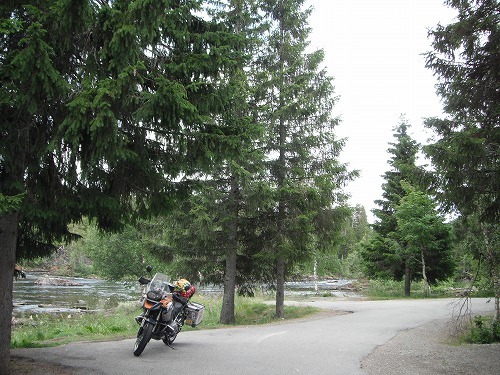 How wonderful to be a motorcyclist. 北極圏突入!! 祝77,777km達成!! マグナス、トーマス、パーベルとの出会い / Arctic circle!! 77,777km!! Meeting Magnus, Thomas, and Paul! It was really cold!! I saw a grey sky when I came out from the tent. I reckoned it would be the same weather like yesterday. Today I used a shirt and pants with heat keeping technology. I guess the last time I used them was in Canada. Or would it be the first time to use them on this trip? I left the site around 7:40am. 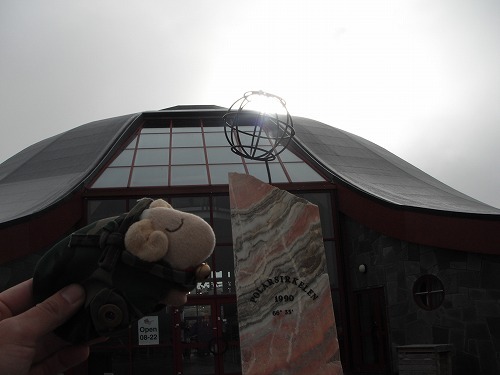 Then I got to Arctic Circle by 8am! Latitude N 66°33'133”!! As I did not go o Alaska, it was my first step beyond Arctic Circle. 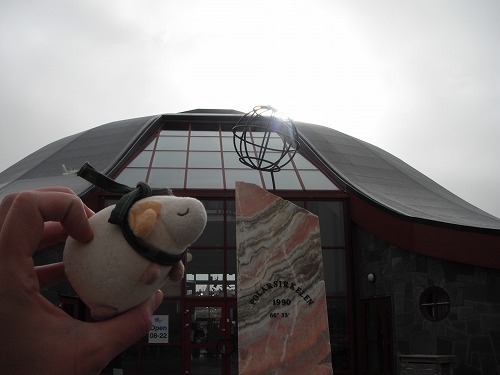 I took a photo of the monumnt with Mr. Sheep. 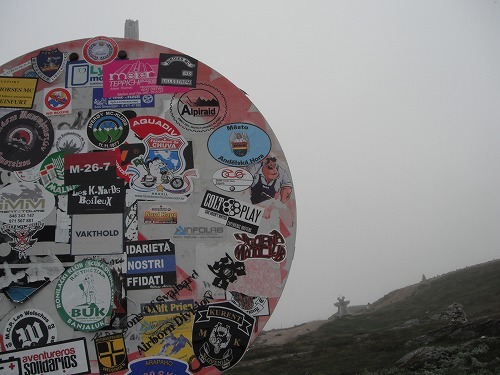 I put my "M-26-7" sticker and "Fazedores de Chuva" sticker on a post. 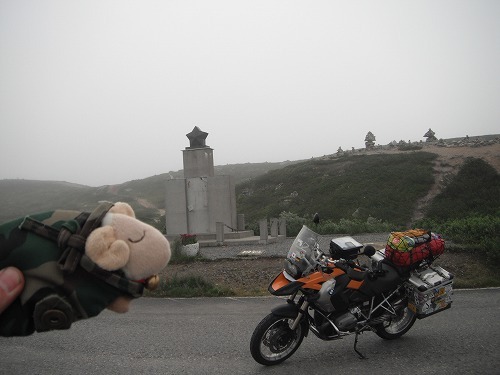 and there was a actual monument of Arctic Circle. Latitude N 66°33'144". Mr. Sheep was really happy too! The landscape around here looked very disolated. 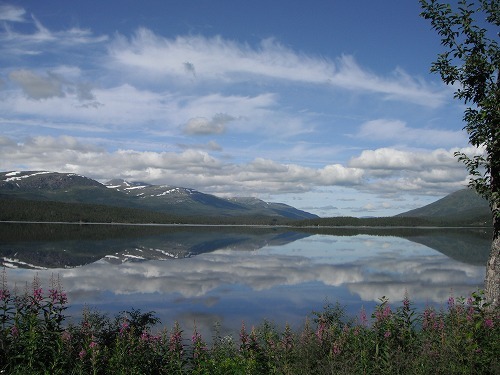 There were forests just before then, but there was no tree around Arctic Circle. Is this forest limit point? 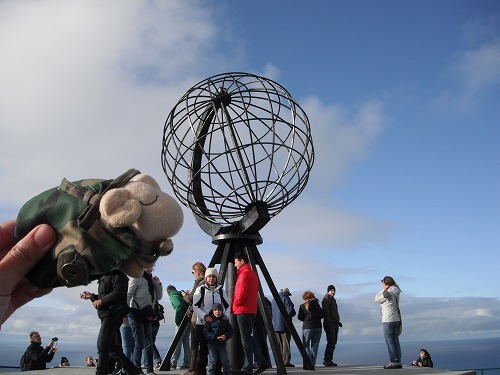 My destination Nordkapp was still far away. I still had lots to ride!! I must go north!! After while, trees came back. I wondered if it was due to the altitude... Around 11am, just before the town of Freske, it started to rain. There was a petrol station in the town entrance, and I made a stop there. It started to rain harder after I made a stop. I had a rest there until the rain got eased. I had 2 hot dogs for lunch. 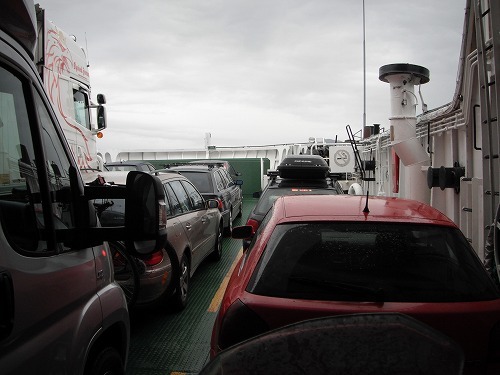 After I left the town, around 40mins or so, I got to a ferry to corss a fjord. 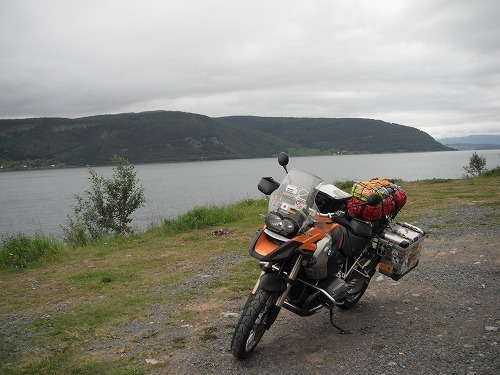 The fjord was just 8km wide, but I had to pay 57 Krones (US$10)!! Very expensive. But on the ferry, I met Magnus from Sweden. 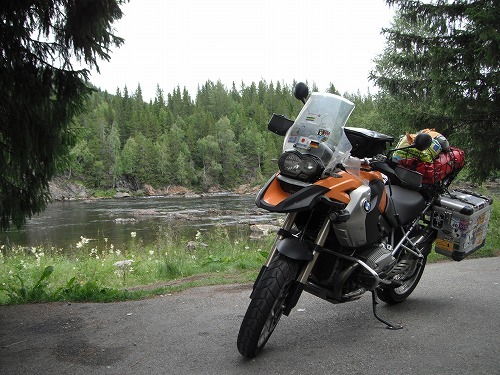 He is on BMW F800GS. 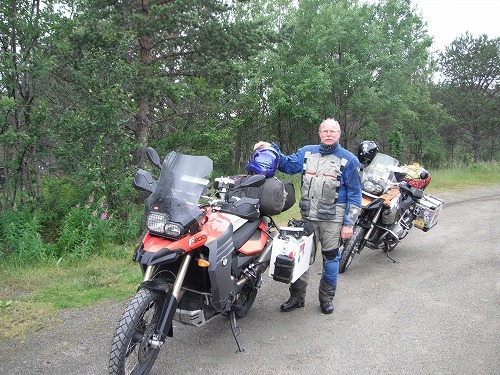 He rode to Mongolia 2 years ago and talking to him was really interesting. 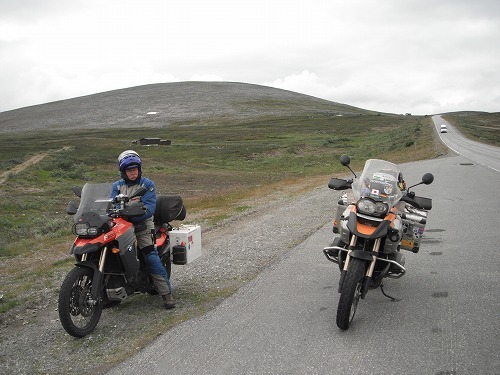 He is also heading to Nordkapp, so we will bump to each other on the way. I tought the rain would be eased at the other side of shore, hut it got harder. I made a stop at a petrol station and wore all my rain gears. Then the rain got heavyier, so I made a stop at another petrol station. Magnus was there taking a rest. He provided me some sandwiches and we talked until the rain eased. I illed up my camelbak and we started to ride together. 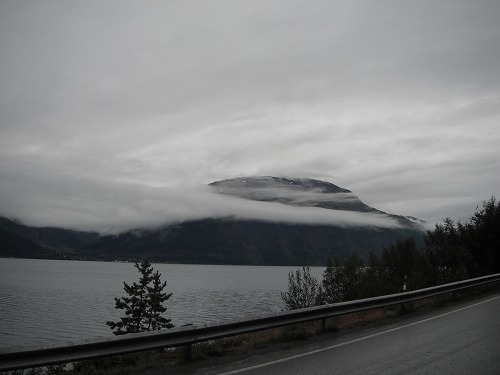 On the way, there was a magnificent view of a large fjord but I could not pull over to take a photo! ANyway, the weather was bad, so I would not take the beauty of the scenery anyway. There were some places I thought they would be amazing if the weather was better. Mountains with glaciers, fjords and the sea. 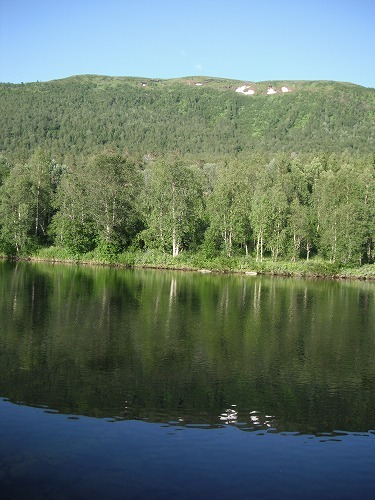 The landscape of Norway is really gfantastic. Magnus wanted to go further today to make the job easier for tomorrow. So we continued riding after 8pm. Fortunately, the rain stopped, well nearly. Then Esperanza reached 77,777km on her clock!! Congratunatons!! We came really far until here. There was a little sunshine came out, so I took a photo. But I could not capture the beauty of the scenery. We overtook 2 Jawa motorcycles (made in Czech). They were really old bikes. It wouldbe hard to ride in this cold. Just before 9am, we found a campsite. The reception was about to close!! 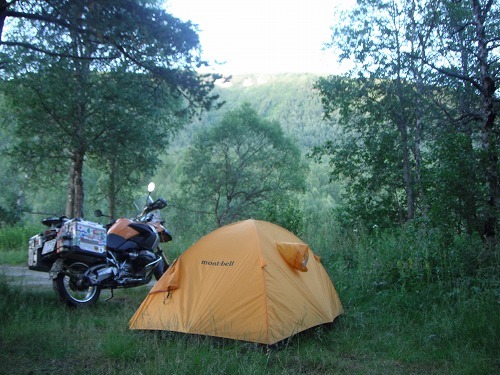 A cabin costs 175ks each and a tent pitch costs 140Ks each. As it started to rain again, we chose a cabin option. While we were checking in, the Jawa riders arrived! They are Thomas and Paul from Czech republic! 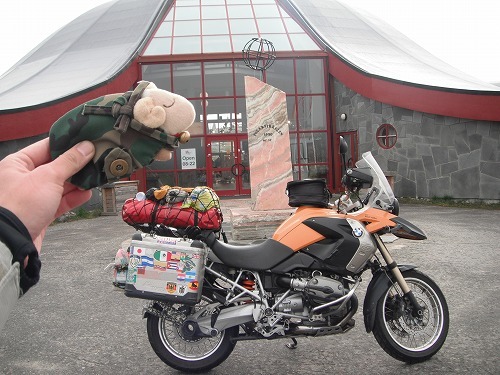 They are travelling from Czech to Nordkapp, then to Moscow. Their Jawas were made in 1964 and 1972 during Communist regeime!! They area making a documentary film and they asked me to be on the film! I will get interviewed tomorrow. A view from the cabin. Nice. It was already after 9pm but still blight. I did not expect to have dinner with 3 other motorcyclists. Magnus brought a portable BBQ set, and he BBQed sausages and pork. It was still blight outside but it was already after 11pm!! 12時を過ぎてもまだまだ明るい北緯70度でした。The sun was set but the sly was still blight like this after midnight. Well I am on latitude N 70°. 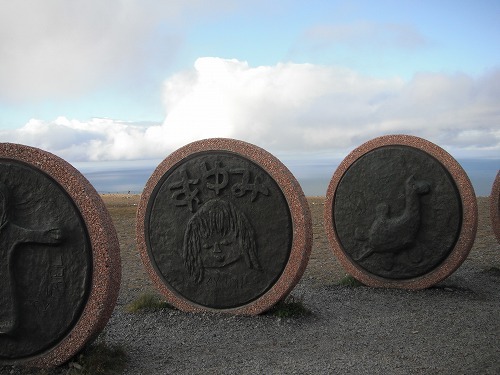 北極圏、まですぐそこ / Arctic circle is... nearly there! I woke up at 5am this morning, but outside of the tent was so cold!! I went back to sleep till 6am. I had to force myself toget out of the sleeping bag. It was cloudy, no wonder it was so cold. I left there by 7:30am. 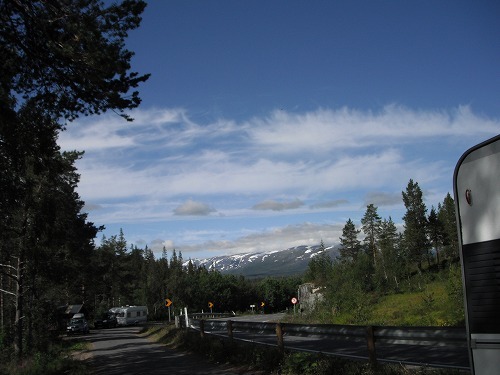 I rode on Route 30, then it merged to Route E6, which will lead me to Nordkapp. I bought 3 breads at a COOP Supermarket. They cost 37 Krones (US$6)!! 500ml Cola cost 17.50 Ks (US$3)!! Those areprice in a supermarket. Really really expensive. But there was a toilet there andfree coffee provided. So I could have a good rest. After 2pm, there was little sun lights came out. The forest of Norway started to shine. 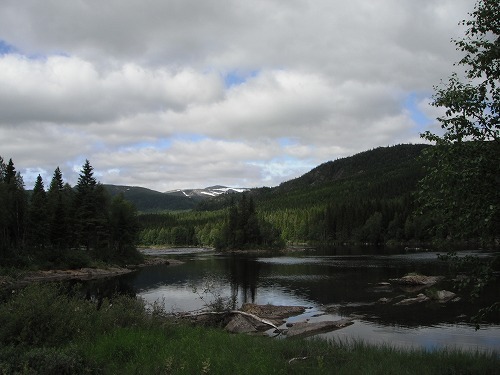 There were beautiful sceneries everywhere in Norway. A rest area beside a stream. Family was playing with water. The weather got better and better. In a distance, there were mountains with snow on top. The latitude was more than N 63°. A mirror like lake and mountains. Magnificent! 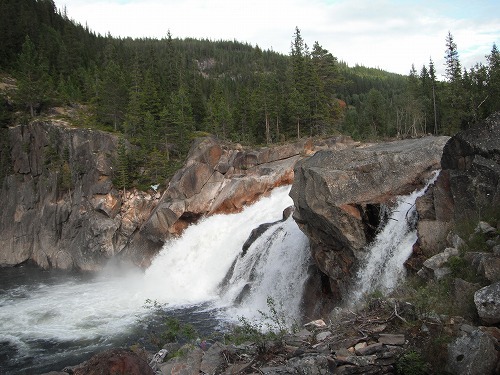 Norway, it's very expensive, but it was worth coming. 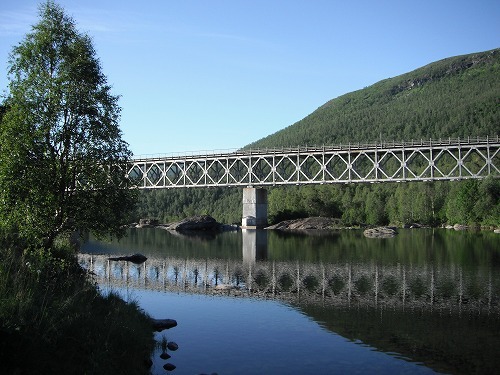 I passed a town of Mo i Rana. There were 2 or 3 rest areas around but I found a best spot. There was a brodge across a beautiful river. A mountain in front of my tent had snow. 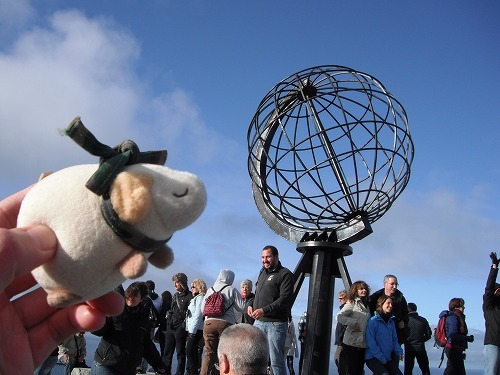 Arctic Circle was just there. Here is N 66°30.201’. 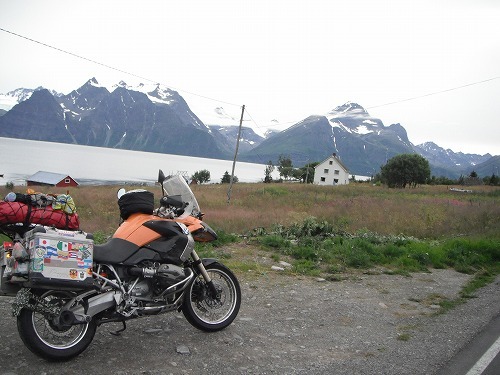 Tomorrow I will hit Arctic Circle. 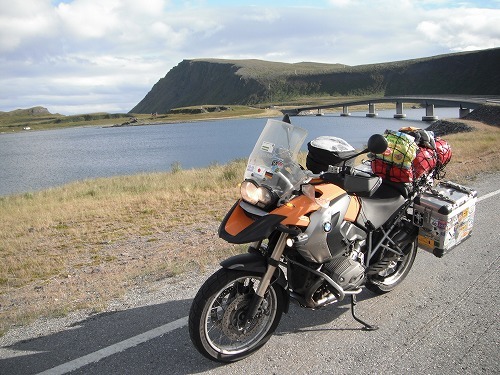 It will take 2 days to get to Nordkapp. From the morning, it was raining hard!! But I mus move on! Goro needed to walk to a bus stop with his heavy luggage, so we wished the rain stop. Fortunately, the rain eased by 8:30am. I said a god-bye to Goro and I took Route 70 to Mora. 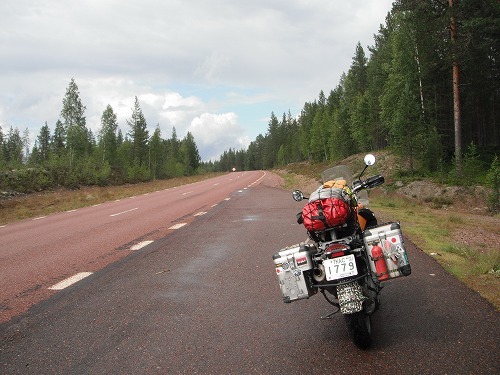 But it took a while to get out of Stockholm as there were many road works and I had to make detours. GPS could not handle detours very well. It was still raining, so I really wanted to move on as quick as possible, hopeing the rain would clear up on the way. 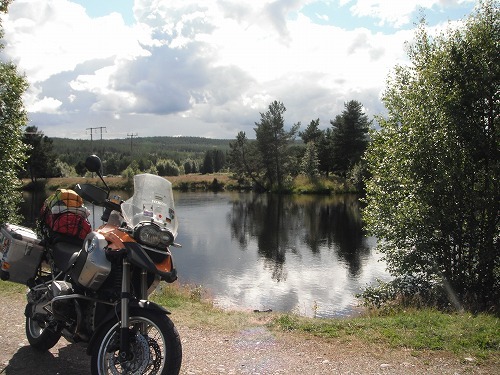 Just before Mora, there were lakes. The sun lights came out a bit. 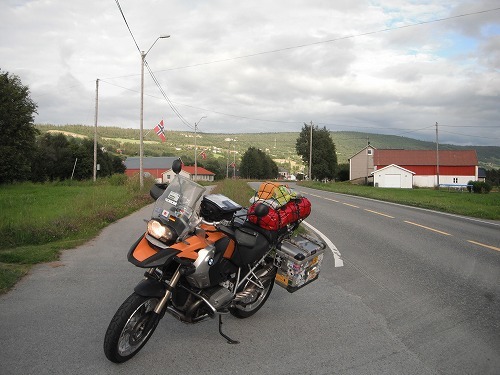 I had a lunch / fuel stop at Mora and continued to the border to Norway. Where there were nice sceneries I could not make a stop, so I could not take much photos. 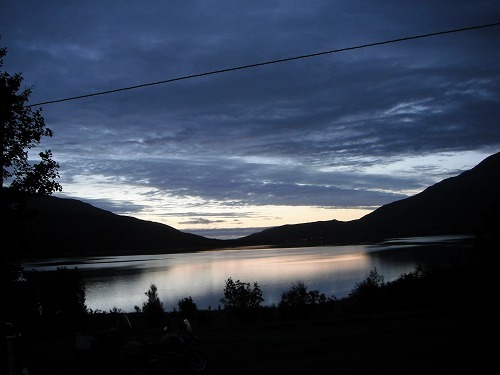 But the sceneries of Sweden were like those of Carretera Austral of Chile. 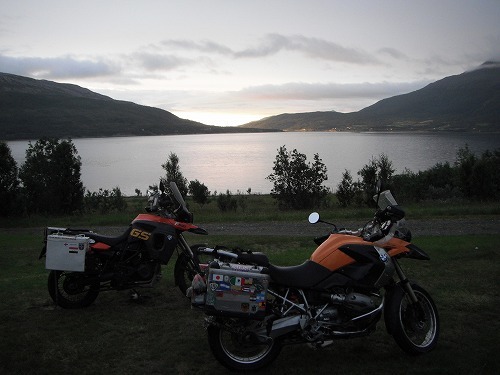 I prefered Carretera Austral better though. 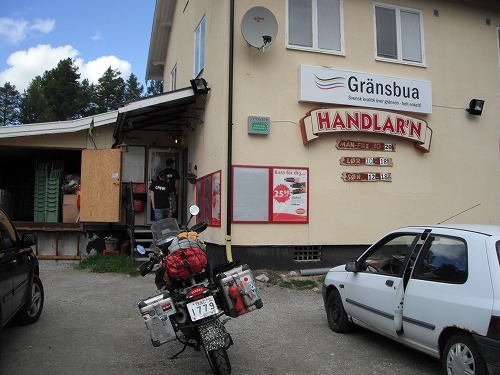 A store just before Norwaygian border. There was a long queue before the checkout. I guessed those people going to Norway stock up here as it would be more expensive in Norway. 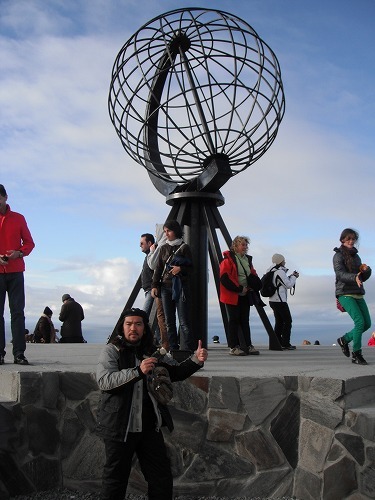 Then I entered the 38th country, Norway!! 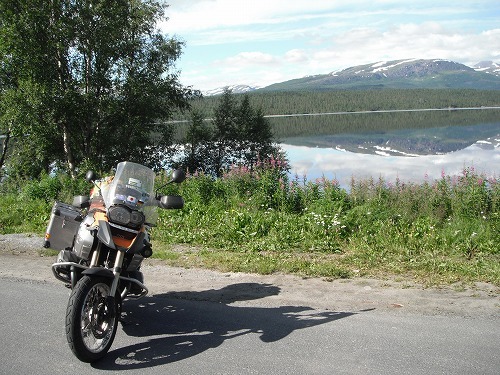 I will ride up to Nordkapp, the norternmost place where can be reached by the public road. 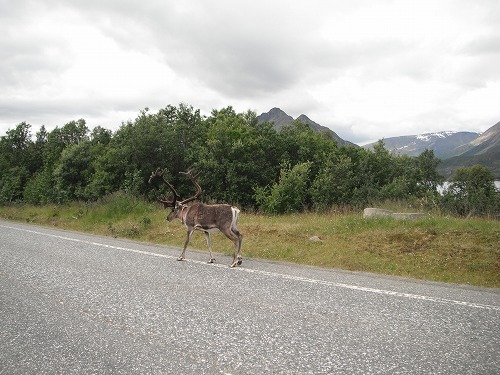 I saw 2 reindeers just after entering Norway. I could not take photo of them as it was too sudden. They could be really dangerous to motorcylists. There was a nice rest area just before Roros. It was next to a petrol station / market. There was a shower / toilets. I asked at the market if I could pitch a tent and a lady said "Of course, you can!". I was tempted to spent a night here, but I thought there would be many places like that on the way, and the day was still long, so I left there (I regreted a bit). I filled up the tank at Roros and got some cash from an ATM, then continued. Just put od curiosity, I asked a price at a campsite and it was 110Ks (US$20)!! Well, it wasn'T that expensive comparing other prices in this country. I saw a sign "WC / Info 16km". I rode 16km and fond a nice rest area. But it states "Here is not a place for staying overnight" in Norwaygian, German and English. Next to the rest area, there was a nice water fall. I thought it would notbe a problem to stay a night here. So I had an instant noodle Goro gave to me for dinner and pitched my tent. The latitude here is N62°50 something. It's 9pm, but it's still bright outside. I will sleep early tonight and get up at 5am to have an early start.